The Quorn, Hoby Vale 1934 by Lionel Edwards. An Original Pencil Signed print, with vignette of running fox. Frame: Original 1" Plain Black with decorated beige mount. The Puckeridge, with Edward E Barclay Esq by Lionel Edwards. Frame: Original 1"dark wood with gold line with cream mount. 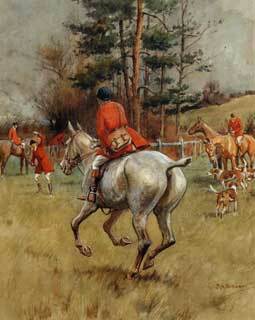 The Puckeridge with Major Maurice E. Barclay by Lionel Edwards. Published by The Sporting Gallery. The Puckeridge with Bob Gardiner on Silver Grill by Lionel Edwards. Frame: Original 1" plain oak with cream mount. Frame: Original 1" oak with cream mount. Frame: Original 1" black with cream mount. Frame: Original 1" Hogarth with decorated cream mount. 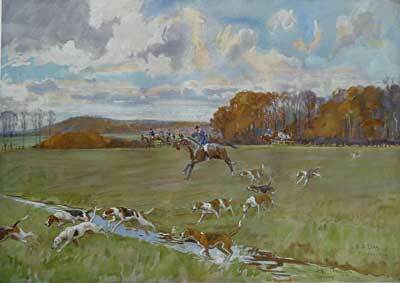 The Cottesmore - Whissendine by Lionel Edwards. Condition: Average, there is a repair to the right. Frame: Black & Gold with decorated cream mount. The Battle of Colluden by Lionel Edwards. An original pencil signed print with vignette. An Original French Hunting Scne , rare, never seen this before. Frame: 1/2" black with green mount. Frame: Original 1" dark wood with beige mount. Eaton Hall, 27th June 1959. Frame: 1" black with cream mount. 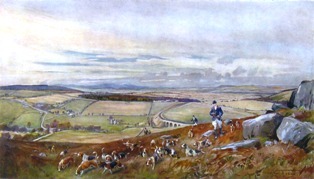 The Buccleugh at Grundistone by Lionel Edwards. c.1934 15 x 20 ins. Published by Eyre & Spottiswoode. Frame: 2" dark oak with gold slip (original) and decorated cream mount. Frame Size: 25 30 ins. The Linlithgow & Sterlingshire by Lionel Edwards. Frame: 1" plain black with cream brown mount. The Belvoir, At Newmans gorse by Lionel Edwards. Frame: 1" plain blck with double cream mount. The York & Ainsty, at Askham Bog, from Askham Bryan Road by lionel Edwards. Frame: 1" black with double cream mount. Frame; Original 1" oak to edge. The R.A. Drag at Borden 1938 by Lionel Edwards. Frame: Replacement 1" plain black with double cream mount. The Meath, at Tara by Lionel Edwards. The Morpeth 1937 by Lionel Edwards. 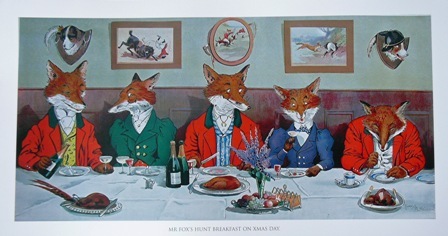 An orginal pencil signed print. The Percy Beagles by Lionel Edwards.